What’s the Best Way to Teach Virtual Courses to a Multi-Generational Audience? Making up this country’s workforce is a mosaic of generations. These include Baby Boomers, Generation Xers and Millennials. While Baby Boomers are delaying retirement to increase their financial security, millennials are entering the workforce and beginning their careers. As a result, corporate learning instructors are faced with the challenging task of teaching students across three generations—all with varying degrees of technological skill, as well as diverse characteristics, learning styles and preferences. How can instructors accommodate all of these diverse learning needs? The first step lies in understanding each generation. 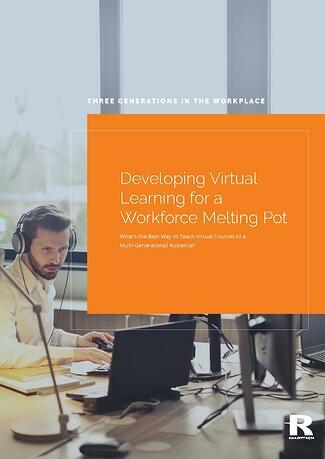 Download this eBook to gain a better understanding of each generation and what this means when offering them virtual training. Learn which generation has the best team players and are known to be revenue generators and relationship builders within a company. This generation prefers to learn on their own schedule in a "learn by doing" environment. 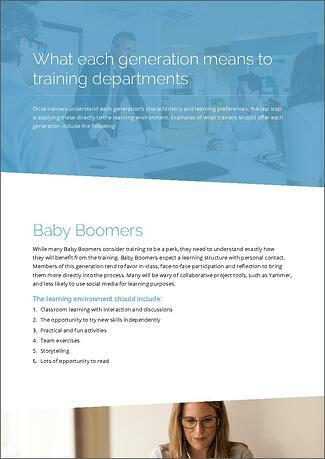 Find out which generation considers training to be a perk, expect training environments to be structured, and have a tendency to favor in-person, face-to-face participation. This generation prefers learning environments that include team exercises, storytelling, and the ability to build relationships with other students. Finally, discover which group is considered to be the most collaborative, adaptive and entrepreneurial. This group needs clear expectations up front, despise PowerPoint presentations (really—who doesn't? ), and need individual feedback with reaffirmation.